Bablicon - "A Flat Inside A Fog, The Cat That Was A Dog"
On their third outing, Blue Hawaii, The Diminisher, and Marta Tennae return with more of their avant rock/classical/jazz excursions. The analogies that come to mind are the same as those heard on their first two CD's. Avant-rock similar to Art Bears, Aksak Maboul, and Thinking Plague, with strong modern jazz influences as well. But what struck me before even playing the CD was the promo sheet which points out that Bablicon's previous albums paired improvisation with loosely structured songs, whereas the new album was meticulously composed beforehand. And indeed, while the music on A Flat Inside A Fog doesn't stylistically diverge from the music heard on their earlier releases, the sense of composition and control is clear, as is a general feel that the band has matured as a trio of musicians comfortable playing with one another. There's an impressive range of instrumentation credited to the musicians... piano, organ, theremin, all manner of electronics and efx, electric bass, upright bass, clarinet, saxophone, oboe, and drums. Intended to be a double album, the first 6 tracks are the Cat That Was A Dog portion and tracks 7-16 are the Flat Inside A Fog segment. The first few tracks are similar, having a modern lounge jazz sound with a touch of cabaret. I really liked the piano and upright bass combo on the opening track, "Blu Hawaii". Things start to get a bit more experimental and intense with "Saumur/Paris/Teatowels". Crowd samples mix with harsh sounds, perhaps a Paris train station. Things kind of drag for a couple minutes until a simple repetitive piano melody kicks in leading the rhythm section down a linear path followed by dancing and prancing electronics. One of album's strengths is the tracks that combine creatively freaky electronics with the jazz and rock styles. The band does a good job of melding truly contrasting experimentations and influences into what sometimes is a unique sound. "Mary" is a standout track in this regard, being one of the jazzier tunes with a cool organ sound. A bit of Soft Machine maybe, but there's plenty of electronics fun, mixing atmospherics with standard jazz instrumental sounds. "Arcdurvish" features an even more interesting contrast between sax and wild electronics. The jazz element kicks in harder as Marta Tennae takes off on the drums while the sax continues its free-wheeling jam and the electronics gurgle and burp alongside. "Aether" goes in a somewhat different direction exploring an avant-chamber music realm with liberal doses of dissonance, juxtaposed tones, and theremin to give the music a freaky edge. And "Pigeon Of Doom" is my hands down favorite track. 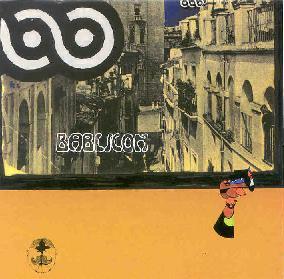 It's an excellent avant-rock tune that reminds me of Art Bears or Thinking Plague, but has Bablicon's indelible stamp. Very intense, with continually shifting rhythms, gripping horns, and a seemingly endless parade of fun sounds. In summary, Bablicon continue to progress with each release and will appeal to fans avant rock that mixes jazz and classical influences. The music is complex, but highly accessible. There's a great deal happening most of the time though the attentive listener will reap its rewards. A Flat Inside A Fog, The Cat That Was A Dog is distributed by Misra. You can visit their web site at: http://www.misrarecords.com/.